The UK’s favourite pizza, Domino’s, has helped to raise £2,200 for its charity partner, Teenage Cancer Trust. 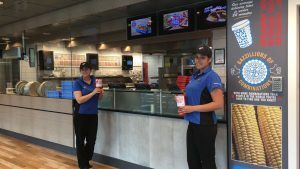 The local Domino’s store in Cardiff City Centre recently ran a Teenage Cancer Trust fundraising week by selling personal pizzas for £1. Teenage Cancer Trust is the only UK charity dedicated to providing the best possible care and support for young people aged 13-24 diagnosed with cancer. The charity has 28 specialist Teenage Cancer Trust units in NHS hospitals across the UK, including the University Hospital of Wales in Cardiff. The unit is for 14 to 25 year olds; it features eight in-patient beds and day care facility, and a chill out and TV area for young people. Teenage Cancer Trust wants every young person with cancer to have access to this specialist support, no matter where they live. This fundraising activity comes as part of Domino’s commitment to raise £2 million for teenagers with cancer, working in partnership with Teenage Cancer Trust. As well as championing Teenage Cancer Trust, Domino’s is proud of its support for local economies and UK high streets, with the recently opened Domino’s in Cardiff creating 25 jobs for the local community.